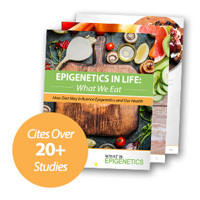 Casticin Found Naturally in Fruits May Epigenetically Fight Off Stomach Cancer | What is Epigenetics? Casticin, a type of flavonoid, could adjust chemical tags on DNA to stave off gastric cancer, a recent study suggests. Found in wormwood and various fruits, including chasteberry and oil from the chaste tree, casticin is able to epigenetically impact the expression of a gene that inhibits stomach cancer. Although additional research and clinical studies are needed, the results hint that consuming a naturally occurring plant compound might fight tumor growth. Gastric cancer, often caused by an infection from H. pylori bacteria, is typically detected in the advanced stages because there are no early signs or symptoms. Only 30% of individuals survive 5 years or more after being diagnosed with this disease. But could consuming the flavonoid known as casticin affect genes linked to suppressing the development of stomach cancer and actually help fight it off? Previous research shows that flavonoids exert epigenetic influence and can bring about positive health benefits with their potential anticancer power. In the current study conducted by researchers in China, gastric cancer cells were treated with different doses of casticin and epigenetic changes were measured. Specifically, they assessed the methylation of a gene that exists in multiple cells and tissues and regulates cell proliferation, known as RECK. DNA methylation, the well-known epigenetic mechanism defined as the addition of a methyl group to DNA which represses gene expression, has been closely linked to cancer for years. When oncogenes, or genes that promote the formation of cancer, are not methylated, cancer can spread. Perhaps more commonly, when tumor suppressor genes are methylated, they are unable to prevent cancer from forming. By investigating this tumor suppressor gene, RECK, the researchers can determine whether casticin is connected to reducing methylation so that the gene can exert its cancer-fighting abilities. Chasteberry is fruit of the chastetree which contains casticin. Credit: NIH/Steven Foster. DNA methylation is catalyzed by a family of enzymes called DNMTs and measuring these enzymes gives researchers insight into DNA methylation activity. The group used EpiGentek’s EpiQuik DNMT Activity/Inhibition Assay Ultra Kit (Colorimetric) for absorbance-based measurement of DNA methyltransferase (DNMT) activity. The activation of the tumor-suppressor gene RECK was linked to reduced methylation of its promoter region. Ultimately, by decreasing the methylation levels through administering casticin, the RECK gene is able to reduce tumor growth. Recent investigation into easily accessible, natural compounds that may act as anticancer agents also includes epigallocatechin gallate which is found in green tea, DHA, one of the major omega-3 fatty acids found in fish and nuts, and sulforaphane found in broccoli. Because casticin causes no toxicity in healthy cells and tissues yet is capable of inhibiting the growth of many malignant tumor cells, it may be a viable option as a demethylation drug that could prevent gastric cancer. Source: Yang, F. et al. (2017). Casticin inhibits the activity of transcription factor Sp1 and the methylation of RECK in MGC803 gastric cancer cells. Exp Ther Med. 13(2): 745–750.